Manipur assembly elections 2017: Polling for the state's 60 seats was held in two phases. New Delhi: The Congress is likely to be marginally ahead of BJP in Manipur, a state it ruled for three straight terms, a poll of exit polls shows at 7 pm. 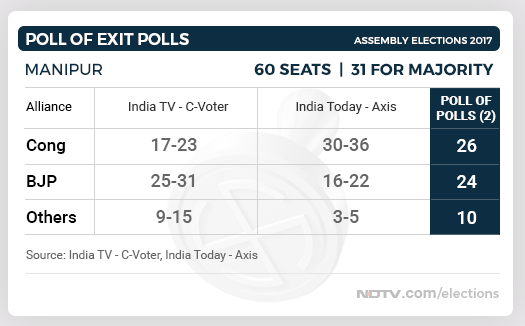 Neither party is likely to get outright majority in the state's 60-member assembly, shows the poll of exit polls, which averages the surveys by the India TV-C Voter and India Today-Axis. The poll of exit polls predicts 26 seats will go to the Congress and 24 to the BJP in the state's 60-seat assembly, where the halfway mark is at 30. The India-TV-C Voter poll predicts the BJP will win 25 to 31 seats -- the upper end giving the party a clear majority. The Congress, it says, will trail with 17 to 23 seats. The India Today-Axis survey gives the Congress 30 to 36 seats and the BJP between 16 and 22 seats. Last year, the BJP had opened its account in the north-east by sweeping the assembly elections in Assam along with its allies. In the process, it ended the 15-year rule of Congress led by Tarun Gogoi. The party won a whopping 86 of Assam's 126 seats - a victory powered by strategic acquisitions of local leaders disenchanted with the Congress. In Manipur too, the Congress has been in power for three terms -- its government led by Chief Minister Ibobi Singh. But over the last six months, in a pattern similar to Assam, many of top Congress leaders have shifted to the BJP. Most of them belong to the Kuki tribe -- traditionally a Congress support base -- who control the hill areas. Chief Minister Ibobi Singh tried to win back their loyalty, but his damage control measure - bifurcation of seven districts said to be for administrative convenience - has only alienated the Nagas. The results of the two-phase polls which ended on March 8 will be declared on March 11. Health Warning: Exit polls don't always get the results right.